Good morning, dear readers. I have some excellent news to share with you this morning. I, The Codger, am the recipient of an E-mail from Bill Gates. Yes, THE Bill Gates, inventor of the computer and wealthiest man in the world, took time away from running his Cyber-McCompany to send yours truly an E-mail message. I had no idea that Mr. Gates had such a spare writing style. His message reads, and I quote, “Congrats (£450,000 GBP).send your name,address,telephone to microsoftgame11@gala.net.” (Don’t worry, Mr. Gates, I’m not going to give my readers the E-mail address you sent me that message from. My E-mail program shows the sender’s address at the top of every message I load, and it’s not the same as the one you put in the message itself. So readers, don’t bother trying to write Mr. Gates at that E-mail, because it’s not his personal E-mail.). Naturally, I submitted my information right away, and I made sure to ask how much money £450,000 GBP is in U. S. greenbacks. I haven’t heard what the exchange rate is lately, but I’m hoping it will at least be enough to spend a few days at the casinos. I didn’t win anything when I was there a few days ago, but with more money to invest there, that should change! After years of getting E-mails from Nigerian scammers, it’s about time that someone reputable should write me and award me my winnings in person! Hello to you, Ms. Rajaee. I trust you are doing well on this chilly Thursday! 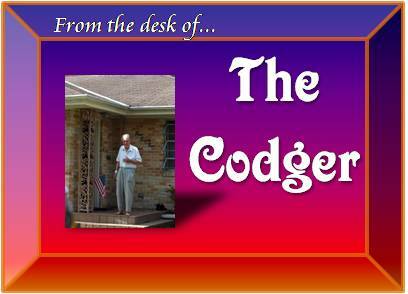 I hope you enjoyed joining our little discussion forum on this here lifestyle column, From the Desk of The Codger.